Vision Mobile recently shared a new chart showing a higher percentage of Amazon Fire developers above the app poverty line versus other platforms. More specifically, 59% of developers distributing their apps on the Amazon Appstore make more than $500 per month versus <50% on other platforms. The chart also showed that developers continue to experience increased monetization in the Appstore - Amazon had a bigger proportion of developers making $5,000+ a month compared to developers on other platforms. We’re excited to see developers like you expand their reach and monetize apps through the Amazon Appstore. “When we compared our 2014 data, we noticed that ARPU on Amazon was 70% higher than on Android and 15% higher than on iOS”. 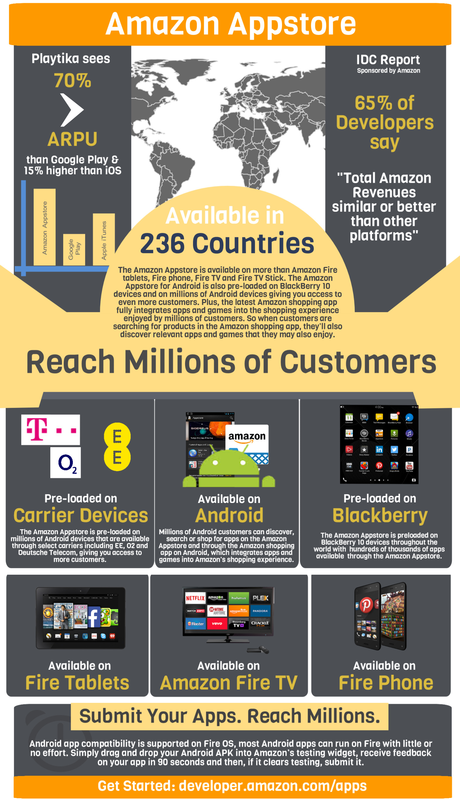 Check out the infographic below to learn more about where your apps will be available once you distribute them on the Amazon Appstore then get started and submit your apps here.